It’s that time again, and this time with extra special birthday shenanigans! It’s the usual NDA fun and games with added NGS birthday celebrations! So come party, eat cake (maybe) and dance the night away!! 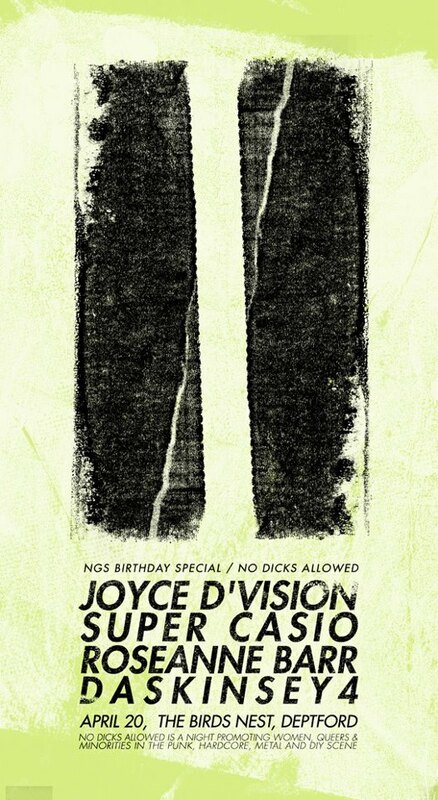 Joyce D’Vision – Manchester’s FINEST, expect drag, glitter and disco! Harry Hill loves ’em, so will you! Super Casio – Awesome songs about being amazing, Harry Potter and partying MEGA hard!! Roseanne Barr – 2 piece no frills, no wave, no nonsense punk rock!!!! Daskinsey4 – Leesey’s coming to rock your world!!! Also, SUPER exciting DJ set from Seleena, with more tbc!!! As usual, free entry and cheap booze! First band on at 9pm sharp, live music over by 11pm, DJ’s til 1! Overground trains from Charing Cross, Waterloo East and London Bridge, all to Deptford Bridge. DLR from Bank/Stratford to Deptford Bridge DLR. Bus route 188 from Central. Tags: club night, daskinsey4, joyce d'vision, no dicks allowed, roseanne barr, super casio. Bookmark the permalink.